On 3 January 2017, the first medical students at the Duke University School of Medicine (Durham, North Carolina USA)will start a four-week course that covers cellular neurobiology, systems neurophysiology, clinical neuroanatomy, and cognitive neuroscience. 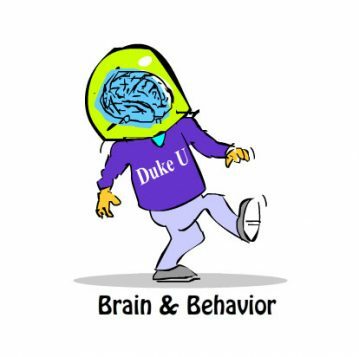 The name of the course is “Brain and Behavior” and is part of the required preclinical science curriculum for medical students at Duke. Professor White is the instructor in this course. They will work through all of Medical Neuroscience, with some additional content on cognition and biological psychiatry, before their final exam on January 30th. We (the Medical Neuroscience Learning Community) would like to welcome those students to the Course Medical Neuroscience and to the supportive website Learn Medical Neuroscience. Moreover, we hope to meet the on-campus students on the Medical Neuroscience discussion forums with questions and reactions to posts of other students. Especially we would like to see their images of their learning experience and the images they produce of neurobiological structures posted with #GetNeuro on Instagram appear on the image carousel on the page Learning Community. On October 11, Dr. Leonard White presented on the Medical Neuroscience MOOC at the Duke University Center for Instructional Technology 2016 Showcase. The event, which is known on Duke’s campus as the CIT Showcase, is a free one-day conference run by the university’s teaching and learning center that celebrates creativity and innovation in teaching. Over 200 faculty and staff from Duke and nearby higher education institutions attended the conference. Previously on this website an article was published: The Story behind “The Story of a MOOC” . Courtney told us about the process of the creation of this free Medical Education online, the course Medical Neuroscience. She also presented an infographic about the creation of the course. Since then the situation has evolved. The course Medical Neuroscience does not only run once a year anymore but multiple times a year, learners can start every month. And this MOOC has found a valuable place in Medical Education around the world. One of the most obvious differences between the in-person and online learning experiences is the communication between learners. Social interaction is an important aspect of learning. Therefore online courses have replaced the classroom with forums, as a way of providing that much needed social element. Another challenge of MOOCs is that the instructor simply cannot provide support to thousands of learners all at once. This, again, is a place where forums can really help. At Coursera we found that simply providing a space for learners to interact and help one another was not always enough. There often needs to be a spark that seeds the discussion. Also, some reassurance that someone is there to respond is welcome. Forums need moderation to make sure the forums remain a safe and welcoming space for all. The first Google Hangout for both sessions on the new Coursera platform occurred on July 20th, at 2pm Eastern Time. It kept lively with stirring questions and great conversations. The following are summaries of Dr. White’s and asker’s words. Ahmed, a Sudanese medical student living in Khartoum, expending on a forum discussion, asked how signaling starts. For example, what factors initiate the signals to make the brain alive vs. dead? 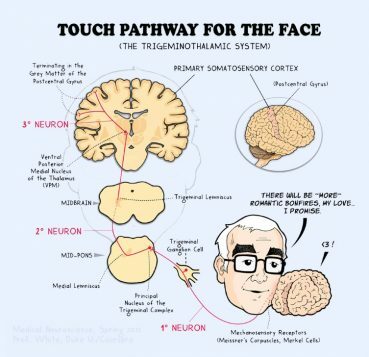 How does the soul interact with the brain? On March 12, 2016 the 2016 Prof. White received the Preclinical Golden Apple award. Prof. White is Associate Professor in the Doctor of Physical Therapy Division at Duke University. 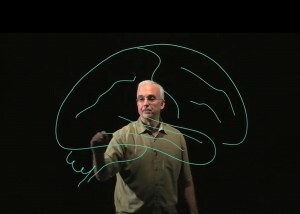 Prof. White is also the teacher of the MOOC Medical Neuroscience. The Preclinical Golden Apple award for the recognition and appreciation of outstanding dedication to medical student education. The Golden Apple is the most prestigious teaching award given by the medical school student body. 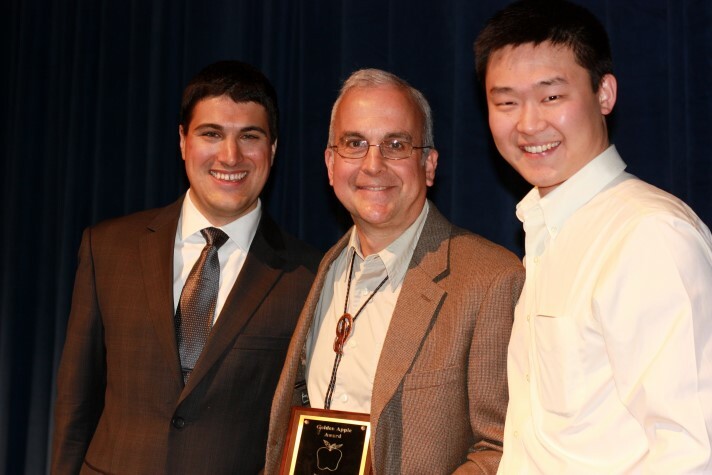 Three awards are given each year: one each to a preclinical faculty member, a clinical faculty member, and a house staff member.